I can't tell you how much I enjoyed reading all of your comments yesterday. The whole world is filled with lovely sewing machines GIRLS! I'm a bit busy working on a little project, so I'm just peeking in on my lunch break. I wanted to give you a stepped back view of my sewing wall. I moved things around recently and am loving this window's southwestern light. I thought I'd wait to share this until I had sewn a new curtain and it was all "styled", but frankly I'm just happy it's tidy in these photos. Right now, this surface is covered in thread and fabric! The table is an old high school science lab station from Craigslist. It has two work spaces and thus fits my serger right next to whichever sewing machine I'm currently working with. It's very sturdy, but a little tall. I have an adjustable dentist stool on wheels that I've hitched up and roll around on. Someday I dream of covering its white vinyl cushion in something prettier. However, I did recently make over the lampshade. An old lace runner is simply safety pinned securely around the shade. Talk about the fastest diy ever! I used to have an inspiration board on the wall above the table, but they get so busy... so I relocated it and put up favorite artwork instead. I tend to sew with a soft and natural palette, but that doesn't mean I don't enjoy a splash of color in front of me. 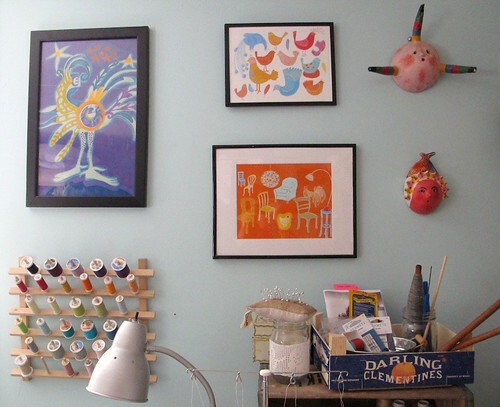 The two framed prints on the right are done by Helen of ZukZuk. 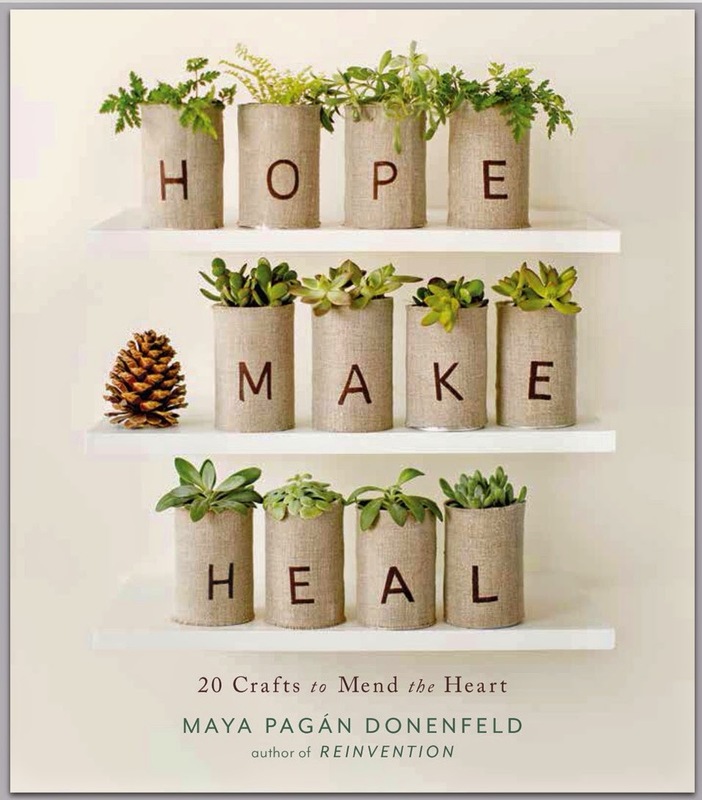 I love her work so much and could see filling my entire home with her happy art! The psychedelic pregnant chicken is an original silk screen my mother did in the 70's and represents my wild and creative childhood. 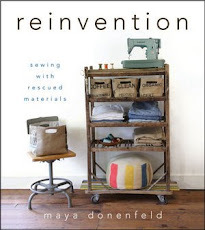 It reminds me to make my own rules when I sew, just the way my mother taught me! The pink coconut masks were brought back from Mexico, where I leave my heart every time I go. That clementine box needs a little straightening, but there you have it. A fresh place to stitch and smile. Very nice wall! I love your girls! They are adorable. Gorgeous...how bright and cheery! It must be nice to sit down to a shot of color during these gray winter days! Lovely area. The wall displaying your art work was the first thing I noticed. 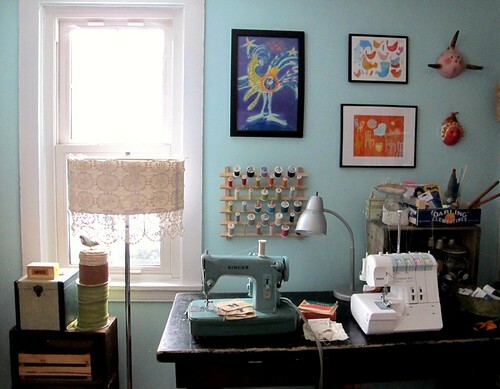 Your sewing space looks so organized and pretty! mine looks like a tornado came through it! haha. I'm terrible with organization. Ruth- mine has been know to look like it was hit by a tornado, too. In fact a storm just swept through. These pictures were taken at a rare calm moment. Your wall looks awesome. I love the window, the lampshade (very clever) and the artwork on the wall is the perfect punch! Your wall is beautiful. I love Zuk Zuk's work too! Thanks for giving a shout out to her! too cute of a space and the blue vintage singer machine is the best. I was smitten with it yesterday in the post. lucky. What a nice sewing space. I just love that pretty Singer of yours! 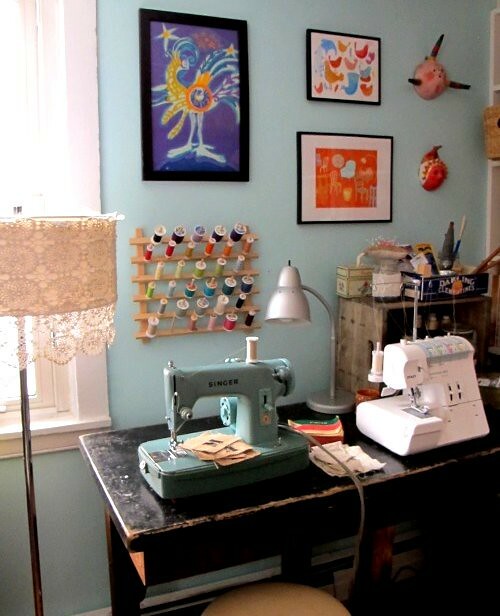 Beautiful sewing corner, I like all those sewing threads on the wall! It's a great nook. It's very cheery and I particularly like the colorful art you're surrounded by. Natural light is a must for sewing, I think. I'm so jealous of how CLEAN it is!!! me encantan tus maquinas de coser.